Helene Blowers |: Filed under Brilliant Library Marketing! My part of the presentation centered on this one thought ... the best way to market your library is to allow your customers to use your brand to market themselves. Anyway, I don't know if anyone was in the audience then from the Louisville Free Public Library and already had this idea cooking up, but it's a perfect example of this idea in practice! Exceptional!!! And, one H-E-double-toothpick (I sound like my mother saying this) of an idea worth copying too!! I especially love how LFPL has dedicated the prime real estate on their website to allow their community to celebrate themselves. Well done LFPL! What a wonderful way to engage the community. Need I go one more? ... Now THIS is what libraries are all about!!! UPDATE: Don't miss reading Craig Buthod's (LFPL Library Director) comment on this post - it provides a lot of background about this fabulous project and marketing effort!!! 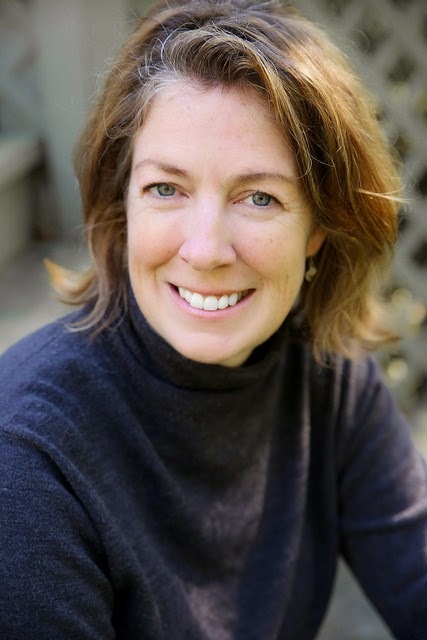 Also see Iris Shreve Garrott over at Checking In & Checking Out for her photo and post. PS: Thanks Tony for the heads up. Thanks for the kind words. 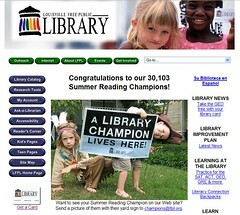 We here at LFPL are extremely proud of our Library Champions. They're part of our most successful Summer Reading Program ever. The sign is part of a prize package for kids who read ten books each during the ten weeks of the campaign. The kids also get a backpack, a pass to the minor league baseball park and a lot of other goodies. All ten-book reades are also entered into a drawing for the grand prize, a full set of World Book Encyclopedias. We give out a set of World Books to one family at each of our 17 libraries and one bookmobile. (All prizes are purchased with donated funds by our library foundation.) This year we had a record-breaking 31,103 kids read ten books each. Four year-round schools had 100% of their students complete the program, which is a staggering accomplishment by the kids, the teachers and the school librarians. Jacob Elementary had 592 "champions" and they're pictured on the web site in a group shot on the school grounds. We set up 592 Library Champion signs and the mayor came out to award the backpacks and the school's reading trophy. The event was electrifying for an old librarian like me -- the most phenomenal reinforcement of the value of reading these kids could ever have. The Library Champion signs are in yards all over the city, in neighborhoods rich and poor. They're also just ambiguous enough to cause a buzz among people wondering what they're about. We're getting great feedback from kids, parents and grandparents about how proud the kids are. One mom told us her son was already proud of his sign but nearly burst when he got a congratulations card for reading ten books. The card was signed by every single person on his block. Among the unintended consequences was learning what happens when you externalize the private act of reading. Kids who thought they were alone in being bookish found out their neighbors were also reading this summer. Then as they rode around town with their parents they saw that kids in other neighborhoods were reading too. It's a nice bug to spread around. A final note about the slide show on the web site: people love it, they stay on the page much longer, they share it (I'm sure they're sending the link to grandparents and family out of town)and they come back to see what new pictures have been added. Credit for the original idea of the yard sign goes to Martha Geier, our manager of collection services. The project manager for our Summer Reading campaign is Tracy Thomas (tracy.thomas@lfpl.org). Lee Burchfield (lee.burchfield@lfpl.org) devised the slide show. And everybody else in the library system worked like dogs to help keep 30,100 kids reading all summer.